April 26, 1976 The 80 foot Master Carl overturned and sank in a storm southeast of Prince William Sound. All four crewmen escaped in a life raft but the ninety knot winds and heavy seas overturned the life raft in the surf near the beach causing the loss of two; Tom Miller of Cordova and Tom Davidson of Westport. The tragedy occurred six miles off of Kayak Island near Cape St Elias. June 25, 1976 Kodiak resident Ole Edward Watson was lost off of the Sea Scout when he fell overboard near Outlook Cape in Raspberry Straits. June 29, 1976 Bruce Mulkiet was lost off of the Gerry D 35 miles SW of Mitrofania. CG Cutter Midget and M/V Eagle aided in the search but to no avail. July 25, 1976 The 34 foot salmon troller Miller’s Bay and a family of three disappeared southeast of Noyes Island, 150 miles south of Juneau. Lost were Robert West (31), his wife Judy (30) and their 14 year old daughter Brenda. The Wests were salmon fishing at the time of the disaster. August 5, 1976 An unnamed small boat capsized near Safety Sound east of Nome and one person was lost. August 8, 1976 Three children were found alive and adrift in a small boat off of Point Romanoff southwest of Saint Michael. Their parents were presumed lost at sea. August 26, 1976 Eight young people were lost when the Deep Sea sank in Whale Pass on a trip from Mush Bay to Kodiak. The tragedy claimed the lives of John W Nichols, Earl McKee, Barney Eldridge, Valerie McRae (23), Heather McRae (20 months), Kathy McRae (19), Mollie McRae (19) and Cy McAvery Rodgers (6). September 22, 1976 The 38 foot sailboat Tigar Lil’ disappeared with three people aboard between Seward and Seattle. 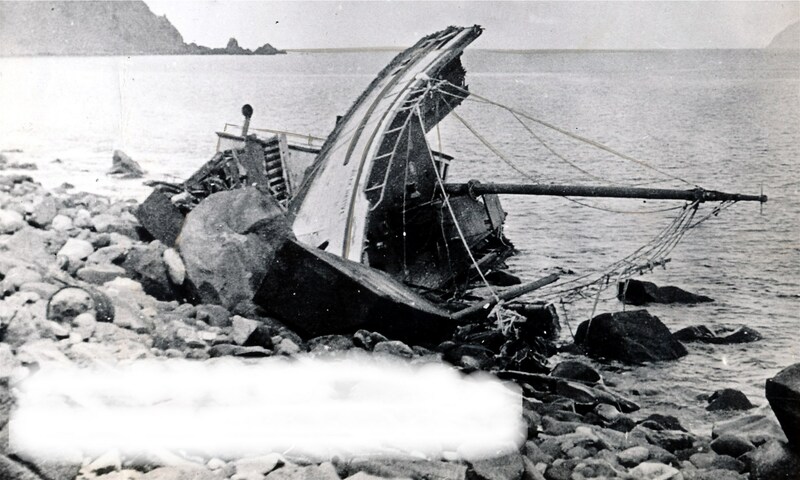 Wreckage was found along Montague Island. The body of Bert Stroud was found on Kayak Island. Lost were owner Donald Lowcock (65), his wife Catherine (61) of Anchorage and Bert Stroud (68) of Seattle. September 28, 1976 One person was lost when one of two unnamed boats carrying 14 clam diggers swamped in Chinitna Bay near Homer. November 1, 1976 Donald Davis (19) and Laura Higby (17) were lost when the fishing vessel Vina capsized and washed ashore at Cedar Pass south of Sitka. November 7, 1976 An unnamed skiff capsized and two men drowned near Narrow Cape south of Kodiak. Fished with the McRae Family that summer, The Deep Sea was our Tender. I missed the boat or would have been with them.